When you read a post that makes you want to cheer, +1 is your applause; when you watch a video that has you in stitches, +1 is your laughter; when you see a photo that perfectly captures that special moment, +1 is your 5-star review. 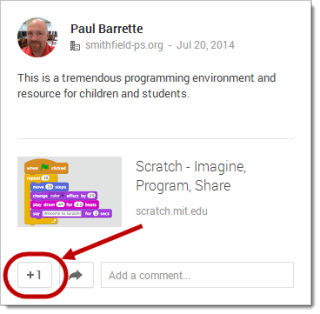 When you +1 a post on Google+, the creator of that post AND the people the post was shared with can see your +1. The creator of the post will receive a notification that you +1'd their post. When you +1 a comment, the creator of that post, the people the post was shared AND the person who made the comment can see your +1. The creator of the comment will receive a notification that you +1'd their comment. So, a good rule of thumb is to only +1 posts, comments or photos when you’re comfortable with other users seeing your recommendation. You can tell that you have +1ed a post because the +1 button will be red and your Profile picture will be visible. To remove your +1, just click the red +1 button.